I couldn't get PulseAudio to work on one of my computers no matter what I do. 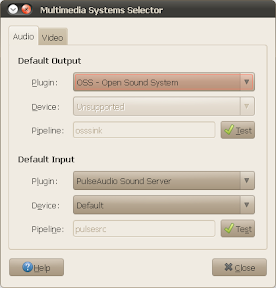 But removing PulseAudio can be tricky and besides, there is a very easy way to "fix" it (if you're using GStreamer as a backend for music and videos). This is very useful for applications which use GStreamer but do not let you select the sound output module like: Rhythmbox, Totem and so on. Then navigate to /system/gstreamer/0.10/default and change the "audiosink" and "musicaudiosink" to "alsasink" or "osssink", depending on what you want to use. I for one used OSS ("osssink" - notice there are 3 s) because it simply works, even though it's deprecated. gconftool-2 --type string --set /system/gstreamer/0.10/default/audiosink "osssink"
gconftool-2 --type string --set /system/gstreamer/0.10/default/musicaudiosink "osssink"
The above 2 commands set GStreamer to use OSS for audio and video players. To use ALSA instead of OSS, simply replace "osssink" with "alsasink" in both commands above. gconftool-2 --type string --set /system/gstreamer/0.10/default/chataudiosink "osssink"
To use ALSA, simply replace "osssink" with "alsasink" in the command above. Then restart your music player or video player (Rhythmbox, Totem, etc.). gconftool-2 --type string --set /system/gstreamer/0.10/default/audiosink "autoaudiosink"
gconftool-2 --type string --set /system/gstreamer/0.10/default/musicaudiosink "autoaudiosink"
gconftool-2 --type string --set /system/gstreamer/0.10/default/chataudiosink "autoaudiosink"
It's that easy - no installation or removal of any app. Note: I've tested this in Ubuntu 9.10 Karmic Koala, but it probably works in other Ubuntu versions / Linux distributions too. And then change Output properties to ALSA or OSS. However, using this GUI method, you cannot change it individually for audio, video or conferencing so for these, use the command-line tweaks above.